Darius will be in the original Broadway cast of Charlie and the Chocolate Factory at the Lunt-Fontanne Theater. Darius is doing the reading of Night Shift, headed by director/choreographer Kathleen Marshall. Darius is joining the cast of the new Off-Broadway revival of Sweet Charity, starring Sutton Foster, directed by Leigh Silverman and choreographed by Joshua Bergasse. Darius is doing a reading of the anticipated Broadway stage adaptation of Anastasia. Darius is doing a lab of the New Group's Off-Broadway revival of Sweet Charity. For the 3rd year, Darius is a guest teacher at the Dance Conservatory summer intensive at St. Paul's School For Girls, in Baltimore, MD. Darius is assistant choreographing Broadway Bounty Hunter at Barrington Stage in Barrington, MA. Darius is joining the cast of Pirates of Penzance at Barrington Stage, in Pittsfield, MA. Darius is Le Chocolat in the new Kathleen Marshall-directed & choreographed musical, My Paris, at the Long Wharf Theater in New Haven, CT.
Darius is joining the adjudication panel of the inaugural MOVE (NYC) 2016 summer intensive. Darius is exciting to be teaching is 1st workshop, in his hometown of Baltimore, Maryland, for the newly founded Broadway Dance Collective. Darius is performing in the New York City Center - "Encores" presentation of Cabin in the Sky. Darius is doing a NY reading for the new musical, Hazel: A Musical Maid in America. Darius is joining the 1st National tour of Rogers + Hammerstein's Cinderella. Darius is performing in Daniel Watts' "Churches" for BC Beat. Darius is performing at the ANOC Awards 2015 in Washington, DC. Darius is a "Dancing Model" for MAC Cosemetics' float in the 2015 NYC Halloween Parade. Darius is performing "I'm Walking" with Devin Roberts & Michael-Leon Wooley for the Broadway and Ballet HERO Awards. 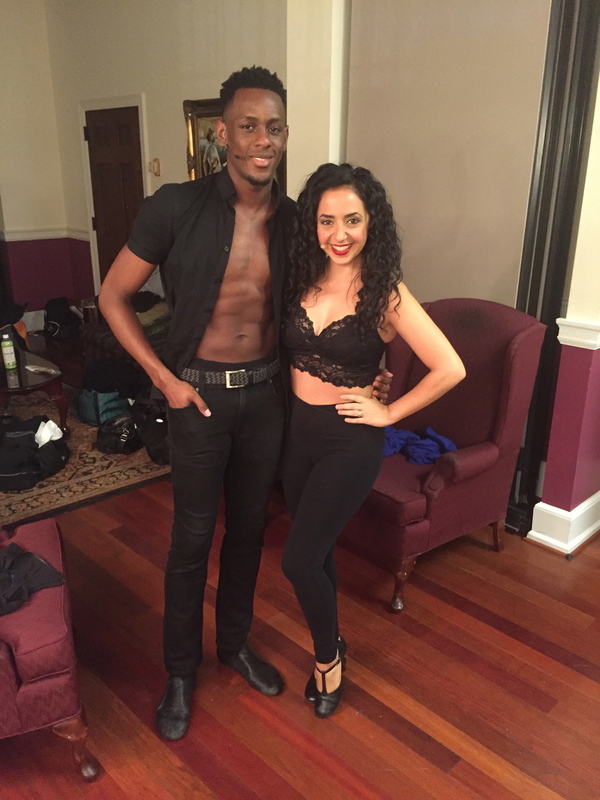 Darius is performing in choreographer Karla Garcia's piece "Rock It For Me", for the New York Jazz Choreography Project at the Ailey Citigroup Theater. Darius is making his Goodspeed Opera House debut as "Phaedra" in La Cage aux Folles. Darius is doing a lab workshop of the new musical, HAZEL, with book by Lissa Levin and direction and choreography by Lucie Arnaz and Chet Walker, respectively. Darius is doing his 1st play! He will play "Moth" in A Midsummer Night's Dream at the Guthrie Theater in Minneapolis, MN. The production is directed by Joe Dowling and David Bolger. Darius' 3rd Broadway show! He is joining the cast of Rodgers and Hammerstein's Cinderella at the Broadway Theater. Darius is dancing in Justin Prescott's "Tumultuous Murmur" for BC Beat. For the 2nd year, Darius is a guest teacher at the Dance Conservatory summer intensive at St. Paul's School For Girls, in Baltimore, MD. Darius will be featured in Grammy award winning singer/songwriter Estelle's new music video, "Conqueror", directed by Paul Jung. Darius is joining the Dance Theater of Harlem. Darius is performing in the 25th Annual "Gypsy of the Year," produced by and benefiting Broadway Cares Equity Fights Aids. He will dance Jeremy McQueen's, "Only the Beginning" and with the cast of Spider-man in "Demons". Darius' 2nd Broadway show! He is joining the cast of Spider-man: Turn Off the Dark at the Foxwoods Theater. Darius is featured in Dance Spirit Magazine. In the article, "No Left Turn," he gives his advice on "correcting one sided-ness." Darius is a guest teacher at the Dance Conservatory at the St. Paul's School For Girls, in Baltimore, MD. Darius is doing his 3rd workshop of Superfly the musical, directed and choreographed by Bill T. Jones, at Montclair State University. Darius is joining the 1st National tour of Memphis. Darius is doing his 2nd workshop of Superfly the musical, in South Orange, NJ. Darius is making his Broadway principal debut, going on for the role of "Gator" in Memphis the musical. Darius is participating in the Bill T. Jones directed & choreographed workshop of the new musical, Superfly! Look for Darius on the CBS' "The Thanksgiving Day Parade," with the cast of Memphis! Look for Darius on the live CBS broadcast of the 65th Annual Tony Awards, with the cast of Memphis! Darius is making his Broadway debut in the Tony award-winning musical, Memphis, at the Shubert Theater. Darius is choreographing "Mandala" on the New York City Ballet, for the New York Choreographic Institute's 10th anniversary celebration. Darius is joining the 2010 production of the Radio City Christmas Spectacular! Darius is joining the Suzanne Farrell Ballet in Washington, DC. Darius is joining the new Metropolitan Opera production of "Aida", choreographed by Alexi Ratmansky. Darius has been invited to join the New York City Ballet. Darius has been invited to choreograph his for 4th ballet the New York Choreographic Institute Spring Session. Darius has been invited to choreograph his 3rd ballet for the New York Choreographic Institute Spring Session. Darius has been invited to choreograph two small ballets for the first New York Choreographic Institute Summer Session. Darius has been invited to choreograph his 1st ballet for the New York Choreographic Institute Spring Session. Darius will be an apprentice with the New York City Ballet.